All praise is due to Allah, Lord of all existence. May the peace and blessings of Allah be upon the Messenger Muhammad, his family, his Companions and all those who follow his Sunnah precisely. 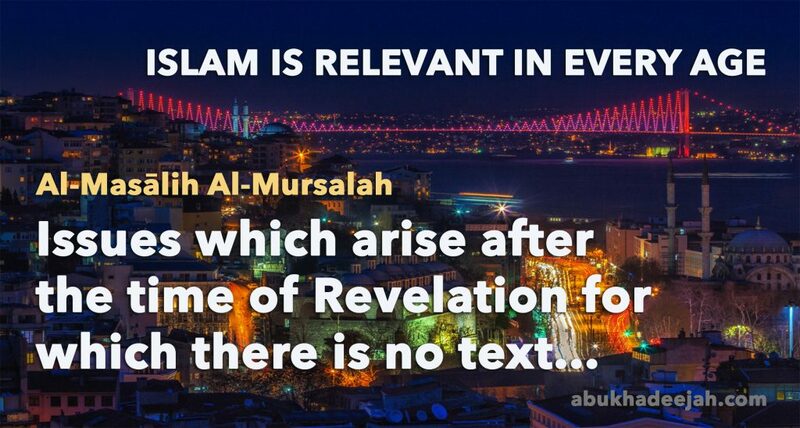 Al-Masālih Al-Mursalah refers to those issues which arose after the time of Revelation for which there is no specific text in the Qur’ān and Sunnah, but the Sharī’ah principles provide a ruling to ensure general public benefit. Other references of legislation which are based upon investigation of the texts. There is no doubt that the Sharī’ah of Islam, meaning the Islamic Legislation or Islamic Law, will remain applicable until the establishment of the Hour. Indeed, there is not a good that benefits a person or society except that the Sharī’ah directs to it through these various reference-points of legislation. Likewise, there is not an evil or something harmful except that the Sharī’ah directs to avoiding it and obligating a person to cast it aside. So the Sharī’ah was revealed with perfection, inherent goodness and the attainment of that good, and it was sent to ward off harm and drive away corruption and evil. 1. That which arises for which there is textual evidence in the Qur’ān and Sunnah. 2. That which occurs in the lives of people and there is not in the Sharī’ah a text for its ruling, so then it enters into the affairs of Ijtihād (i.e. deduction from the Revealed Texts to come to a verdict). “We have neglected nothing in the Book, then unto their Lord, they all shall be gathered.” (Al-An’ām 6:38) So in the Book of Allah and the Sunnah of the Prophet (ﷺ), there are the foundations of all the issues that arise till the establishment of the Hour as well as all the principles that can be used as evidence such as Ijmā’, the sayings of the Companions, Qiyās and so on. All of this is rooted in the Book and the Sunnah. In the era of ‘Umar Ibn Al-Khattāb (may Allah be pleased with him) matters arose which required the establishment of governance. So ‘Umar (may Allah be pleased with him) set up a governing mechanism and a treasury for the benefit of the people. In the era of ‘Uthmān Ibn ‘Affān (may Allah be pleased with him) he gathered the Qur’an into a single written Mushaf (book) and united the people upon it, and he revoked the rest of the parchments upon which the Qur’ān was written. He passed judgements in many affairs that occurred wherein there would be benefit for the people. It was the same at the time of the Tābi’īn, then in the time of the well-known jurists and scholars. They would consider issues that arose that were not previously present. They passed judgements regarding them, and they called this knowledge, Al-Masālih Al-Mursalah, i.e. rulings that are established for the general benefit of the people, even though there is no direct textual proof (such as the compilation of the Mushaf in the time of ‘Uthmān). So Al-Masālih Al-Mursalah (or Al-Mutlaqah) are rulings that are for the benefit of the ruler or for the general good of the people; they are given consideration and used as proof even though there is not in that issue a specific text. These are rulings that agree with the goals of the Sharī’ah though there is no specific text. So it is a ruling that is suitable due to a specific event or situation that comes about in line with the goals of the Sharī’ah. It can come about due to a need, or necessity to avert a harm. So regardless of whatever comes about or befalls the people in their lives, the scholars have a ruling on it after giving it their consideration. And they rule on an affair with whatever the evidence points to, or with whatever brings about the Sharī’ah benefit and removes harm. That is because the Sharī’ah (Islamic Law) was revealed to bring about benefit and to avert evil. The scholars have named one of the proofs that are used as, Al-Masālih Al-Mursalah as we have already stated. That is because an affair arises that was not present at the time of the Prophet (ﷺ), or it was not required to be established at the time of the Prophet (ﷺ). And that is due to that environment not being in need of it, whether it be related to a worldly affair or a religious affair, or even a combination of the two. So the scholars investigated these matters and issued guidelines and rulings. For example, ‘Uthmān (may Allah be pleased with him) gathered all the people around one version of the Mushaf. His gathering the people around the Mushaf of ‘Uthmān was a religious matter, yet this was not needed in the time of the Prophet (ﷺ) because the Revelation was still being sent and Surahs (chapters) and verses (āyāt) of the Qur’ān were still being arranged, according to revelation from Allah. For this reason, the Mushaf was not placed in order, into a single book during the lifetime of the Prophet (ﷺ). It was left as such through the Caliphate of Abu Bakr and ‘Umar, though it was preserved in scripture form under the order of Abu Bakr because the memorisers were dying [see footnote 2]. Then it was compiled into a unified Mushaf in the time of ‘Uthmān (may Allah be pleased with him) in order to avoid disputation. The scholars considered this judgement of ‘Uthmān to be a binding Sharī’ah ruling, and they made it obligatory that the ‘Uthmānī Mushaf be the standard to be followed. Not the term, ‘The ‘Uthmānī Mushaf’ is an ascription to the Caliph ‘Uthmān because he gathered the people together upon this Mushaf. It is not an ascription to the Ottoman (Uthmānī) Empire of later times as some people incorrectly think. Likewise in the issue of the First Adhān on the day of Jumu’ah which was instituted by ‘Uthmān Ibn ‘Affān (may Allah be pleased with him). It too was a religious matter, and the scholars agreed with him and follow him to this day. And there were many other affairs related to the worldly-matters that have rulings associated with them that were not present in the time of Prophethood – and these judgments were issued for the general public benefit (Al-Masālih Al-Mursalah) such that they are considered matters of the Sharī’ah. So it is obligatory for all the Muslims that if they know of a ruling of the scholars or a fatwa, and they are issued from scholars of Sunnah, Hadīth and Salafiyyah – they must act upon their verdicts. They do so as an act of worship and obedience to Allah just like the verdicts issued by ‘Umar and ‘Uthmān. Many affairs have taken place that the scholars have ruled in for the general benefit of the people. Concern for what is in the interest of the people enters within the principles of the Sharī’ah that are proven by the text of the Qur’an and the Sunnah of the Prophet (ﷺ). There will be more on this later. “And do not kill yourselves [or one another]. Indeed, Allah is to you ever Merciful. And whoever commits that through aggression and injustice, We shall cast him into the Fire, and that is easy for Allah.” (4:29-30) Allah made the ruin of oneself, self-harm and suicide forbidden and he threatened those who engage in such matters with punishment. “Verily, your blood, property and honour are sacred to one another like the sanctity of this day of yours (the day of ‘Eid Al-Adhā), in this month of yours (the month of Dhul-Hijjah) and this city of yours (the city Makkah). It is incumbent upon those who are present to inform those who are absent.”  Meaning: the wealth of the people is harām upon you to violate, so transgression against the wealth of another is harām. The lives of the people among you are sacred, and to transgress against the life of another in any way is harām. So if that is the case, then whatever leads to the violation of another’s wealth, or person, or life, or honour is harām due to the end-result being harām. So, for this reason, one must not take lightly what is placed in the law which benefits the people and at the same time does not oppose the Sharī’ah Law. That is because paying attention to those rules is to pay attention to the principles of the Sharī’ah. So to abide by them is something required by the Sharī’ah itself because those ruling are based upon the goals of the Sharī’ah and not in contradiction to them. “When there comes to them some matter affecting public safety or fear, they spread it among the people. But if only they had referred it the Messenger or to those charged with authority among them, then the ones who can draw correct conclusions from the matter would have understood it. Had it not been for the Grace and Mercy of Allah upon you, you would have followed Shaitan, save a few of you.” (4:83) So one should not be in the habit of claiming that the scholars have not judged in accordance to the Sharī’ah in the matters that are for the general public benefit or that avert harm from the people. There are many rulings of the Scholars in our times that people should not ignore. Scholars such as Ibn Bāz, Al-Albānī, Ibn ‘Uthaimīn, Al-Fawzān, Abdul-Muhsin Al-‘Abbād, Rabee’ Al-Madkhalī, Ahmad An-Najmī, Zayd Al-Madkhalī, ‘Ubaid Al-Jābirī, Muqbil Ibn Hādī, etc. Look at the people and what befalls them when they abandon what is obligatory upon them in terms of adhering to the rules and laws that enter into Al-Masālih Al-Mursalah (i.e. for the public good) that agree with the Sharī’ah – how being lax leads to corruption through harming others by putting their lives in danger, or transgressing against the wealth of others and their property, or their honour. When these fatawa of public benefit that are in line with the Sharī’ah principles are violated, you see the people living in fear of their lives and in fear of their wealth being taken unjustly by those who are not restrained. The scholars of Salafiyyah have spoken about laws related to cars and driving, laws of transport of animals for slaughter, animal welfare, shelf-life of food products, title-deeds and ownership procedures for property, storage of fresh produce, hygiene regulations in restaurants and food establishments, establishing court-buildings for trying and convicting criminals, prisons for incarceration, planning laws so that the rights of the neighbours are not violated, registration of marriages, births and death to protect lineage, property law, libel laws, trading merchandise, etc. All of these are laws found in Muslim countries for the public good that safeguard life, honour, wealth and property as mentioned in the hadīth at the Farewell Hajj. So Islam is truly a religion for all times and all places. People imagine that these laws in society have no consequence and no connection to the Sharī’ah. That is because they have not understood the maqāsid (goals) of the Sharī’ah. Now that this Sharī’ah Principle of Al-Masālih Al-Mursalah is evident, how do we give it the importance it deserves? 1. Hifdhud-Dīn: Preservation of the religion of the Lord of creation through the establishment of the religion by acting upon the Revelation and protecting it from distortion, deviation and loss. 2. Hifdhun-Nafs: Preservation of life from ruin or death. 3. Hifdhul-‘Aql: Preservation of the intellect from that which may harm its function such as the use of intoxicants and drugs. 4. Hifdhun-Nasl: Preservation of the lineage from ruin through fornication, adultery, etc. 5. Hifdhul-Māl: Preservation of wealth from theft, etc. A loss in any of these results in corruption. Ash-Shātibī stated, “The Ummah has agreed; indeed all of the religions (that came before) agree that the Sharī’ah was sent to preserve these five necessities: to preserve the Religion of Allah, to preserve life, lineage, wealth and intellect.”  So Al-Masālih Al-Mursalah return back to these five matters in consideration of the rulings (and fatāwā) that result from events and situations that were not present at the time of revelation. As Muslims we regard these affairs to be important, so we pay attention to what the scholars have said regarding those rules which are instituted for the public good. And truly Allah wants from us to fear Him concerning the rights of others and be dutiful to the principles of the Sharī’ah and what they point to as it relates to the public good. 1. The Sharī’ah of Islam (Islamic Law) is built upon bringing benefit to the servants and warding off harm and corruption from them, both in this life and the next. So the Sharī’ah does not command with anything except that it is a pure benefit or an overwhelming benefit. And it does not forbid from anything except that it is purely harmful or overwhelmingly harmful. So this principle is present in all of the Sharī’ah — whether the intellect of a person comprehends that or not. 2. The Sharī’ah has not neglected any benefit or good. There is not a good except that the Prophet (ﷺ) encouraged us to practice it, and there is not an evil or harmful matter except that he warned us from it; either by specific mention or mention of it in general form. For example, the principle “There is to be no causing of harm and no reciprocating of harm” is a general warning, whereas the prohibition of alcohol in the texts is specific. 3. If this is known, then it is not possible for there to be any contradiction between the Sharī’ah and Al-Maslahah (general and specific good). It is not conceivable that Allah would forbid that which is good for the people, either purely good or overwhelmingly good. And it is not believable that Allah would command with that which is wholly evil and harmful or that which is overwhelmingly so. a) That the Sharī’ah does point to that beneficial matter, but this claimant does not know that due to his lack of knowledge of the Sharī’ah and his ignorance. b) That he believes something to be beneficial that is not beneficial in reality. Some acts are performed by the people seeking by them nearness to Allah which Allah has not legislated, i.e. innovations. There is no doubt that they are harmful to the people and their harm outweighs any benefit they claim is present. If acts of innovation were beneficial, Allah would not have neglected to command them. So Al-Maslahah Al-Mursalah does not allow for innovation (bid’ah) in religion acts of worship. Bid’ah in the Religion is that which is practised by the people through which they seek nearness to Allah, but in its practice, or in the manner of its practice they have no proof from the Qur’an or Sunnah – such as those who practice the ‘Eid Milād (birthday) of the Prophet. 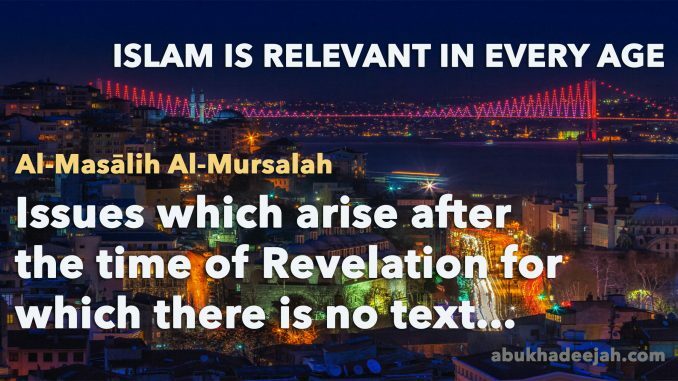 The rulings of Al-Masālih Al-Mursalah come about due to an incident that was not present in the time of Revelation, but the principles of the Sharī’ah are used to provide the people with answers in line with the five necessities of the Sharī’ah: preservation of Religion, life, intellect, lineage, and wealth. Sometimes the ruling is for a necessity in order to ward off corruption (dar’ul-mafāsid) such as to prevent killing and to establish retribution against criminals. Sometimes the ruling is for a need rather than necessity; it brings ease to a situation. 1. The verdict must not oppose the revelation or the ijmā’. Note: The difference between Al-Maslalah Al-Mursalah and Qiyās is that Qiyas is based upon specific analogies that are textually present that connect two affairs on a shared basis, whereas Al-Maslalah Al-Mursalah is a ruling based not upon a particular text that one returns to, but to overarching principles as discussed above. 2. So the ruling is based upon the goals of the Sharī’ah in protection and preservation: i.e. Religion, life, lineage, intellect and wealth. 3. The rulings of Al-Maslahah Al-Mursalah cannot alter established rulings of the Sharī’ah that are unchangeable, and in those matters where there is no place for ijtihād. That is because those affairs are firmly established in the Sharī’ah and cannot be changed because the Religion is one and complete. Allah stated, “This Day I have perfected for you your religion.” So rulings of Al-Maslahah Al-Mursalah cannot alter the obligations and the prohibitions already in the Sharī’ah. 4. The rulings of Al-Maslahah Al-Mursalah cannot oppose a judgment that is better than it or equal to it. And one is not compelled to act upon a verdict where one is increased in harm and evil. The above shows how Islam always remains a relevant and influential force in the lives of Muslims and in society because it answers the challenges in every age without violating the principles of the Qur’ān and Sunnah. It is no wonder that Islam is still the fastest growing Religion in the world with tens and thousands embracing the Religion every year. We ask Allah for guidance and beneficial knowledge. And all praise is due to Allah, the Lord of the worlds, and may the peace and blessings of Allah be upon the final Prophet, Muhammad, his family, his Companions and all those who follow him precisely. Acknowledgement: Some of what I have written above was based upon an excellent piece by Shaikh Sālih Ibn Abdul-‘Azīz Ibn Muhammad Ālush-Shaikh in his Majmū’atul-Khutub Al-Mimbariyyah, pp. 310-318 (Publisher: Dār Al-Imām Al-Bukhārī, 1425H/2014CE). Abu Dāwūd no. 4604, from Al-Miqdād Ibn Ma’d Yakrib (may Allah be pleased with him). Authenticated by Al-Albānī in Sahīh Al-Jāmi’ no. 2643. Bukhārī no. 67, Muslim no. 1679 from Abu Bakrah (may Allah be pleased with him). Some typos have been fixed and sentences improved to make reading easier.